We were approached by a leading magazine and periodicals distribution company to look into ways in which we can both increase the amount of totes palletised in a day, whilst at the same time reducing the quantity of staff required to do it. With an average of 17,000 totes palletised per day, minimising the amount of people required in this very labour intensive process was fundamental from a manual handling point of view. 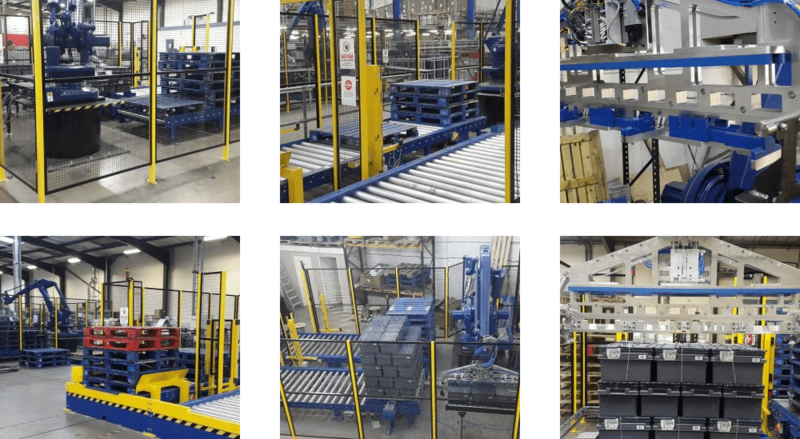 Our technical design team set about creating a vision of a robot palletiser collecting totes and stacking them in the customers required stack pattern. Fairly early on it became evident that just handling these bespoke design totes would be fairy tricky. After weeks of discussions, deliberation and drawing, we came up with the idea of a finger collection and clamp system to pick up the totes at strategic points. There was also the need to collect totes in batches of 3’s and 4’s so a twin sided gripper head was created. Our client for this project is now benefiting from significantly increased productivity and a more streamlined process flow. With the capacity to handle over 900 totes per hour, our robotic palletiser system can palletise over 21,000 tote bins every day of the week.